Consequence of Sound: On a November weekend in 1977, Steven Spielberg released one of the best American science fiction films ever made. It’s not often that one can make such a definitive statement about a piece of art, subjective and ever-mutable with time as they so often are. 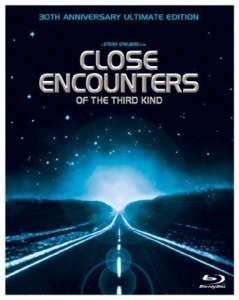 But Close Encounters of the Third Kind is the rare film that warrants any and every laurel it could possibly receive, a film that was considered exceptional in its time and now, 40 years later, stands as a testament to Spielberg at the very heights of his powers as a filmmaker, and to what film as a medium can achieve at its most wide-eyed and ambitious. Today, in the Internet era of criticism, a lot of movies garner hype and acclaim and fail to stand the tests of time and memory. Close Encounters does something that’s rare even by the standards of the all-time greats: it only continues to appreciate with time. Hollywood Reporter: It isn't, however, a horror show even though we have, to use the phrase, "actual contact with the occupants of a UFO," and some of the earlier sightings involve phenomena every bit as chilling and mystifying as The Exorcist. Steven Spielberg's script is grounded in the belief that UFOs do in fact exist (at one point a reporter states that while he has been covering air crashes for 20 years, he has never actually seen one); and Spielberg's direction — aided by a battery of special effects people — makes them palpable enough to convince even the most confirmed skeptic. And John Williams' impressive, massive score cancels out any possibility that Spielberg, unlike George Lucas, is working with his tongue in his cheek. If this be kidding, it's kidding on the square. Slant: In normalizing the scientifically possible but sociologically irrelevant notion that there’s more to life than Martin Scorsese’s mean streets or Irwin Allen’s man-made destruction impulse, Close Encounters is both the last great gasp of ’60s hippie ethos and the first masterpiece of what would become an increasingly technocratic ’80s movie-house takeover. In other words, for a film in which a man spends so much time not knowing what he’s doing or why, it’s got a lot to answer for. And though Spielberg is often thought of as the most American of directors, since when has America endorsed such strident naïveté? Or been inclined to tender trust in the unknown? RogerEbert.com: You will notice that I have not referred to it as a science-fiction film and that is because, despite that it is roundly considered to be one of the pinnacles of the genre, it is not really one in the traditional sense, as Spielberg himself states in a brief featurette preceding screenings of the film. Oh sure, it does deal with the concept of mankind’s first encounter with visiting beings from another world but it isn’t really about them per se. Until the very end, the creatures themselves are kept off-screen and their presence is only represented sporadically via mysterious lights and fleeting glimpses of their spacecraft. In fact, the film is more of a drama with conspiracy thriller overtones that looks at how those of us on Earth might react to the possibility that there really is something out there by following two parallel narratives that eventually come together in the final act. I don't remember a whole lot about this movie, but I never, ever forget to make a little butte out of my mashed potatoes every time I eat them. One of the reasons why I didn't get into The X-Files as much as I might have was because I'd already seen much of its subject matter--the conspiracy theories, alien abductions, obsession with cryptids, and so on--back in the seventies. By the time Chris Carter rolled around with his series, I'd already worked through my credulity and realized how a combination of wishful thinking, errors in perception, and occasionally darker motives (such as Erich von Däniken's refusal to believe that non-Europeans could build geometric monuments with precision and durability) had combined in many of not most of these cases. But back in 1977, I was young and still believed, and Spielberg managed to combine the wonder of much of his later canon and the combined terror and awe of Jaws and came up with something really compelling. UFO sightings jumped by 500% after this movie was released. Recent relevant Ask Reddit thread: [Serious] People of Reddit that honestly believe they have been abducted by aliens, what was your experience like? I saw this a couple of months ago for the first time in at least 30 years. Parts of it hold up really well. Parts of it, less so. But still fun. I love this movie so much. Easily in my top 5. I first saw it when I was in about first grade. I'm surprised it didn't freak me out more. There are some very scary scenes in it. I think it mostly filled me with wonder. What's out there? What would it be like if aliens visited us? I think I've seen it at least 20 times since and I never get tired of watching it. So many great scenes. I think most of it hold up. I also feel like if and when aliens ever do visit us, it will be more like a HUGE EVENT like this and not some little flying saucer buzzing a trailer park somewhere. I will watch the last 15 minutes of this any time it's on and have myself a nice, inspired cry as humans communicate with aliens through music. I remember getting mad that the score didn't win an Academy award before realizing that John Williams lost to himself that year for Star Wars. A true classic, a weird melding of 1970s grungy grown-up drama and Spielbergian blockbuster stuff. All the stuff with Richard Dreyfuss and his fracturing family is so tough to watch, and probably could have only happened in 1970s cinema. I saw this movie a few years back and I was struck by just how vulnerable and frankly pathetic Roy gets, he has these big weepy meltdowns while his wife and kids are just terrified and kind of disgusted by him. (The bit where the one kid hollers about how he's a "crybaby" is just brutal.) When he goes off in the spaceship at the end it's transcendent but it's also such a 1978 baby boomer guy fantasy, ditching your nagging wife and kids and all your earthly responsibilities to go dwell in the cosmos. Spielberg himself has expressed ambivalence about it, after he had his own kids. It does play differently in 2018 and Roy comes across as more of a manchild, but at the same time his story makes sense to us. He was tortured by this vision and HAD to follow it, he was losing his mind. It was a time when people were really questioning life and going on these big journeys, sometimes leaving behind miserable, bereft spouses and children. If this film had been made 10 years earlier or 10 years later it would have been something else completely. I'm not sure it could have worked, or had the same resonance. By being made when it was, it captured the zeitgeist in this strange way. Terri Garr is the true hero of this movie. Richard Dreyfuss freaks out, loses his job, becomes increasingly unstable, wastes potatoes and then runs off one day never to return, leaving her to raise those kids on a lineman's pension. I believe this one was the first in a long line of Special Effects Departments sneaking R2-D2 into their sequences. Also, there's the story about how Lucas visited the set of Close Encounters while in the middle of editing Star Wars and being so convinced that Spielberg's film was a masterpiece of SF and was going to blow his little "kids' movie" out of the water at the box office that they made each other a bet on the success of the two films by agreeing to give each other 2.5% of what they made on them. As wonderful as Close Encounters is, Spielberg made bank on that deal. And also, an you imagine how she's going to be treated? She's going to be dragged into a windowless government office and interrogated about everything to do with her husband, especially his final days. They will refuse to answer any questions. Her phone will be tapped, her mail opened. The kids will grow up with the constant presence of government agents in the background, watching them. This is my favorite movie of all time. So many wonderful elements and themes: the opening scene using real air traffic controllers, the mystery of the vintage vessels in the desert, music as a universal language, the desperate yearning to belong, Devil's Tower, the awe at first contact (which wouldn't be replicated, IMO, until Arrival. So, so good. "This means something. This is important!" Just rewatching this, and I observe in the Barry Abduction Scene, that the aliens seem to be really big assholes with sneaking in the chimney freaking out mom and all.